A touch of blackberry and cassis with a slight earthiness. In addition there is a slight creamy note with a touch of cinnamon. Refined, elegant in a typical Rutherford fashion. 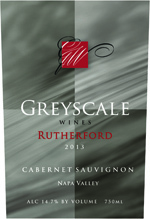 Our 2013 Rutherford Cabernet Sauvigon comes from a famed vineyard in the heart of the Rutherford Bench. Sadly, we cannot mention this vineyard by name due to contract restrictions.